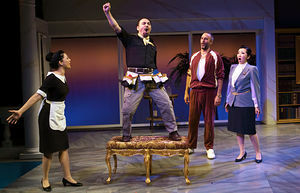 From left, Samarie Alicea, José Adán Pérez, Ethan Herschenfeld and Sahoko Sato Timpone in “¡Figaro! (90210)” at the Duke on 42nd Street. Political strands in familiar works have been popping out with new resonance in a series of recent performances.